Herbed Potatoes Anna is a classic recipe which adds a touch of elegance to a comforting potato side dish. Because I have a food blog and the Mr. and I share an unabashed love for going out to eat, we’re often labeled as “foodies.” I don’t despise the term, but I’ve also never identified with it. Wikipedia defines a foodie as someone who has an “ardent or refined interest in food.” While I most definitely have an ardent interest in food, I could hardly call it refined. Sure, I enjoy a chef-created menu with delicate flavors and gorgeous presentation, but most nights I’d just as soon have a Classic Bacon Cheeseburger or a pile of creamy mac and cheese. I’m not a food critic, a judge, or a gourmet. I simply love food in all it’s many elegant and not so elegant forms. In my mind, this Herbed Potatoes Anna hits the sweet spot between simplicity and refinement. It looks lovely on the plate, but at it’s heart, this dish celebrates one of the simplest, most comforting flavor combinations out there: Potatoes and butter. I was thumbing through a vintage cookbook recently when a recipe for Potatoes Anna caught my eye. I had never heard of the dish before, but it sounded too good not to try. The most stripped down version of this recipe is made with layers of potato brushed in butter, salt, and pepper, then baked until golden and crispy on the outside. The finished dish is reminiscent of a potato pie, which is inverted onto a plate and served in wedges. Potatoes have always been a staple on holiday tables, but a recipe like this makes them the star of the show. Idaho potatoes are an incredibly affordable way to not only add a flavorful and comforting side dish to your menu, but to do it in style. Potatoes Anna reminds us why the humble potato is still the go-to side dish for so many occasions. There simply isn’t anything quite as alluring as potatoes and butter. For my version of this classic dish, I added a simple blend of fresh rosemary, thyme, and Gruyere cheese. It enhances the flavor, but doesn’t detract from the plain, simple, goodness of buttery potatoes. This is the kind of recipe that might earn you the nickname of “foodie” as well. It looks stunning on the plate, and would be lovely on your Passover or Easter tables. Your guests will ooooh and ahh over the crispy golden edges and flecks of thyme, but at the end of the day, this is just a 5 ingredient recipe which makes the most of one of life’s simplest pleasures. I love it not because it’s beautiful (although that’s certainly a bonus), but because it’s positively delicious. For a reluctant foodie like me, that’s all that really matters. Skip the mashed potatoes and go for something just a bit different this holiday season. For more creative, elegant potato side dishes, visit Idaho Potatoes’ website, and be prepared to see the potato in a whole new light. Preheat the oven to 425 degrees. Cut a piece of parchment paper to fit the bottom of a round baking dish (it should be at least 4 inches tall). Brush the bottom of your baking dish with melted butter, then press the parchment on top. Brush it with additional butter. Set aside. Use a mandoline slicer to slice the potatoes into thin (1/8 in) circles. Assemble a work station with your potatoes, melted butter, the chopped herbs, shredded cheese, and salt and pepper. 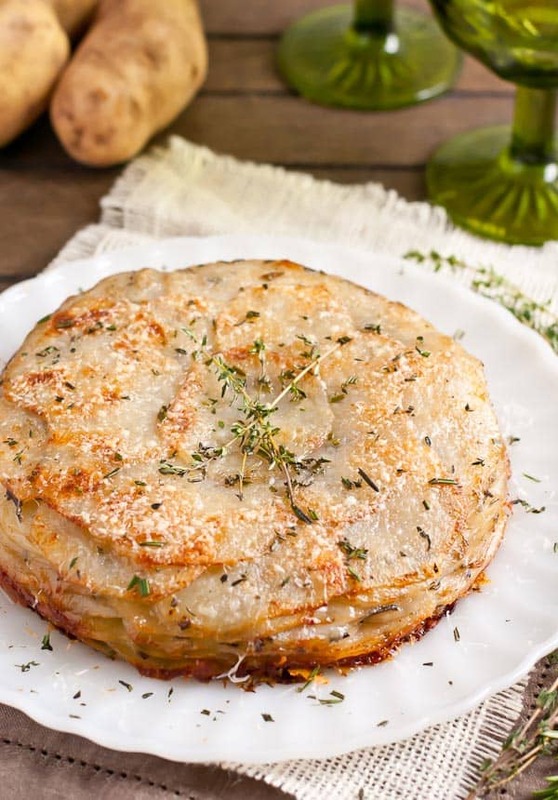 Start by putting a slice of potato in the center of the baking dish then layer the potatoes over top of it in concentric circles, all the way out to the edge. Brush with butter then sprinkle lightly with salt and pepper, herbs, and cheese. Remember, every layer will be seasoned so it's best to keep a light hand with the salt and pepper. Repeat with remaining layers until no potatoes remain. Cover the dish with aluminum foil (butter it if it's touching the top of the potatoes) and bake for 30 minutes. Uncover the dish, then bake for an additional 30 minutes, or until the potatoes are golden. Remove the pan from the oven and run a knife around the outside of the pan. Place a large plate on top of the casserole dish then carefully invert the potatoes onto the plate. If desired, you can sprinkle the top with a final layer of cheese and place the plate back in the oven and broil for 3-4 minutes to brown the top. Garnish with fresh herbs. Serve in slices, like a pie. Note: This post is sponsored by Idaho Potatoes. As always, all opinions are my own. Thanks Erin! It was a fun dish to make and photograph. What an elegant dish–absolutely gorgeous! I know what I’ll be making for Easter this year. Pinned. I’ve always loved potatoes Anna but this is the prettiest version of it I’ve ever seen. And adding the cheese is just genius because…cheese! Yes…I can never resist adding cheese to a potato dish! They’re just meant to be together! I also think that people sometimes mis-judge us as “foodies” who are REALLY picky. Like, “I don’t want to take you to my favorite restaurant because you’ll probably hate it.” Except no, no I won’t. I love food, but I’m not super picky about it at all, if that makes sense. If I get served a sub-par dish at a restaurant, I’m not going to put up a big stink about it. Anywhoo, can you air-mail me one of these? Because the cheese-and-potatoes version of the foodie in me would love a big slice. Yes! I luuuuurve Kraft mac & cheese, and am not the least bit embarrassed to admit it. I don’t eat it all the time, but I definitely NEED it a few times a year or so. Holy whoa, that looks incredible, Courtney! 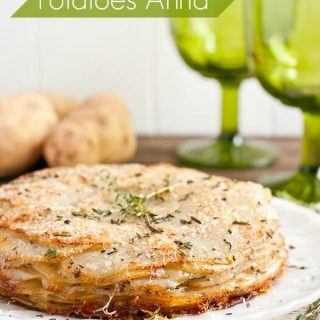 I’ve never heard of Potatoes Anna either but it’s something I want to get acquainted with! 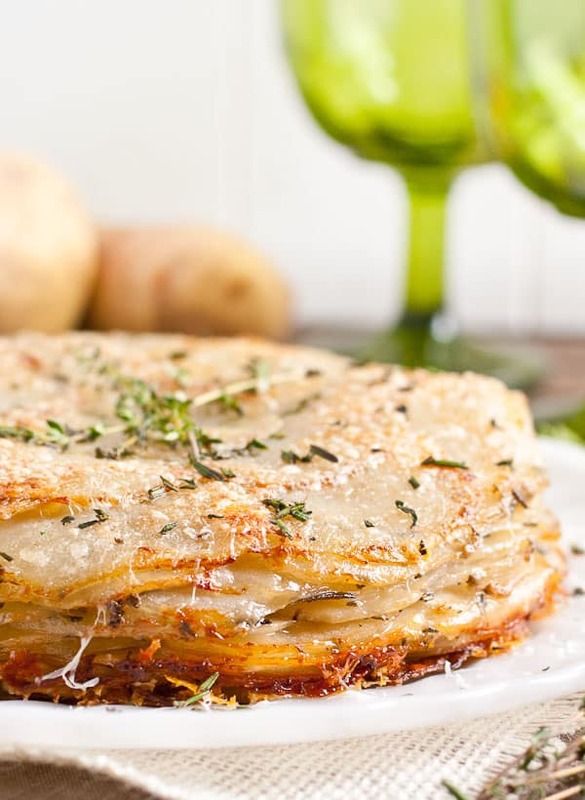 Beautiful job on layering all those potato slices and those crisp, golden edges are perfect. It’s kind of like a potato chip casserole but so much more elegant. Not ashamed to say I could eat this entire thing by myself. Ummm yes. Potato chip casserole sounds like the best thing ever. I don’t consider myself a refined foodie either. Give me a burger over a dainty dish any day! 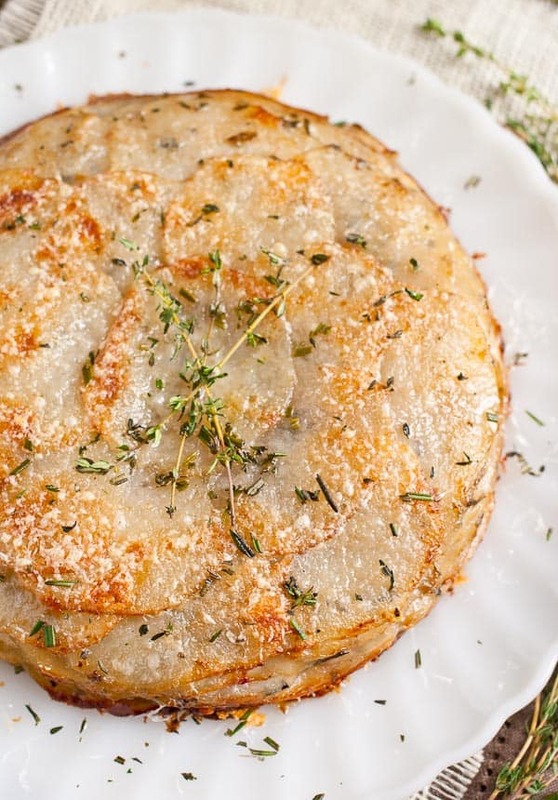 Every year for Easter, we usually make scalloped potatoes, but this Herbed Potatoes Anna may just take the table! I think these might trump our traditional party potatoes too. Just can’t beat those crispy edges! ohhh yum!! HAPPY ST.PATTY’S DAY TO YOU! I’m with you on rather eating a burger than a fancy meal (but I’ll never turn one down) but pass me this potatoes anna over some fries! The last time I made one was a long time ago but it’s the perfect combination of buttery soft potatoes and the crispy ones. Your version is just stunning! Courtney, thank you for a beautiful recipe. May I make this the night before Easter? 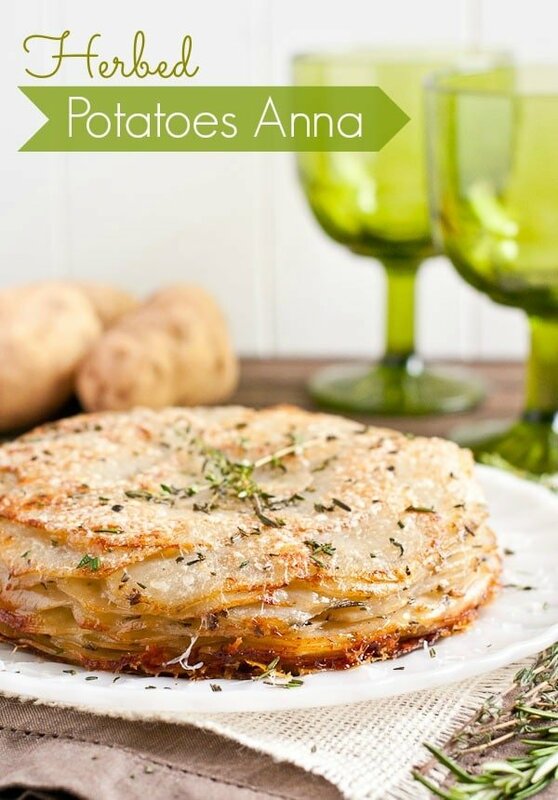 I once had a bad experience with either potatoes Anna or scalloped potatoes made the night before. They turned black. It was a disaster. Hi Barbara, It shouldn’t be a problem to make this ahead of time. I actually made mine, ate a few slices, refrigerated overnight, then reheated the entire thing in a 350 degree oven the following day. It turned out fine, so there shouldn’t be any blackness! If you notice it getting too dark, you can cover it with foil. Hope you enjoy! Wonderful! Thanks so much for coming back to let me know! What I hate is not being able to read the recipe on my tablet with all the Pinterest, Facebook and all the other social media posted on the side, where it gets in the way, with no way to close them so you can read the recipes. I’m really sorry it was showing up for you that way. Can you tell me what kind of device you were using when it displayed this way? I’m trying to make sure my settings work for all different sizes of device. Have you ever done this is a cast iron?? Wondering if it will work and if so should I adjust anything?? So sorry for the delayed response. I was having some trouble with my commenting system! I have never tried this in a cast iron skillet, but I think it might be hard to get it out of the pan. Unless you wanted to serve it straight out of the skillet, I would probably stick to a round cake or casserole dish. This looks and sounds delicious! Making night before and re-heating next day. Should I remove from pan after baking to store in fridge or just leave in pan until re-heated the next day? Thanks! I think you should be fine doing either! I have made this, removed if from the pan, eaten a few slices, refrigerated, and then reheated in the oven at 350 degrees the next day without a problem. I would just keep an eye on it and cover with foil if it starts to get too brown. Good luck! Love,love, loved these potatoes! Family went crazy over them! Thank you! That’s so awesome! Thanks for coming back to let me know! Question: Would it be ok to use a SpringForm Pan? I am dying to try these for Easter Dinner. I think a spring form pan would work great! But I would set it on top of another sheet pan just in case there are butter leaks. Good luck! Could you use Large RED potatoes vs Idaho for this recipes? Do you think this could be made ahead and kept in the fridge? It absolutely can! Just make sure to cover it well, then reheat in the oven to crisp up! Can I make this the day before, then reheat for Easter? we need the over space. You absolutely can, but I recommend reheating it in the oven so you still get the nice crispy edges! This looks so beautiful, I’m thinking about making it for Easter. Would it work if I baked it in a spring form pan? Do you think it would be possible to do russet and sweet potatoes to give it a nice splash of color? Good question! I think it would bake fine. My only concern would be if the butter would run out of the pan. I think if you try it with the spring form, you’ll definitely want to set it on top of a sheet pan in case there’s leakage. And sweet potatoes mixed in would be lovely!